It has been a busy, but blessed summer! We began with our "Ballerina" Camp for ages 4-11. The theme was "Going to the Nations". Each child had their own passport, filling it each day with a new "stamp"! 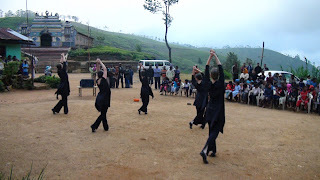 They traveled to every country that LWBallet has been to and learned the ethnic dance of that country. We had our first Summer Dance Outreach with several students traveling to Syracuse from out of state. The first week consisted of learning choreography and how to minister. The second week they performed 7 times: 2 Chapel outreaches, 2 Refugee centers, 1 adult home, 1 hospital, and a demonstration for supporters. I was so blessed by each of the students, allowing the Lord to stretch them! The Company traveled to India and Sri Lanka for 2 weeks. We saw several people come to Christ and receive a healing touch. During that time we performed 14 times, and sometimes even on dirt, in front of Hindu temples. It was a life changing experience. It was great to see our contacts in both countries being used mightily of the Lord in what they are doing. Hannah Beaver, from Ballet Magnificat, came and set a piece about persecution in China this past weekend ("Living Hope"). Hannah is our first guest choreographer and we were so blessed to have her. Starting September 13th, this coming Monday, the School, Trainees and Company begin a new year! We all have raised expectations of what the Lord has planned for this new season! He is faithful- may we never forget!! In November, the Company will be performing in Ohio and PA. In March 2011 we will be traveling to Peru.